The Courtyard by Marriott Princeton hotel surrounds travelers with the conveniences that make business and leisure travel easy. With outstanding newly renovated accommodations and amenities such as free Wireless Internet, comfort bedding, 32" flat screen HDTV's and large work area, our hotel near Princeton University, University Medical Center of Princeton Plainsboro and Mercer County Park is the perfect choice when looking for convenient location. This New Jersey hotel is close to local businesses, dining, and area attractions. Experience refreshing business in our new state-of-the art lobby complete with Bistro. Unwind at the end of your day by relaxing in our heated indoor swimming pool and fitness room. In addition, with 1 meeting room totaling more than 700 square feet of meeting space, the Courtyard Princeton hotel provides the perfect setting for your next business or social engagement. 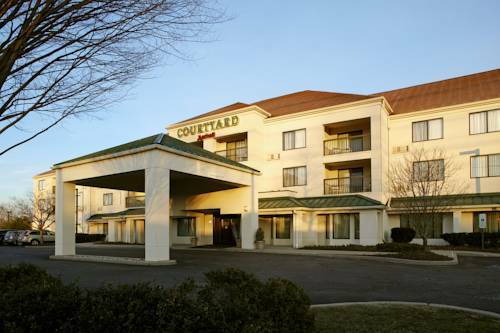 Among Princeton hotels, you'll find we have it all here at the Courtyard by Marriott Princeton!